There's more to life than increasing its speed. We don't notice slow change until we step back. Who has time for that? 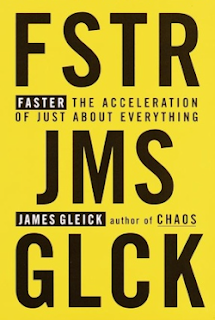 James Gleick, author of Faster: The Acceleration Of Just About Everything. Example after example, shows how our lives have been speeding up. Quicker often means more expensive. We spend time to earn money. Then we spend money to save time. To save more time, we work more hours to earn more money. Circular. Earlier, we looked at how much we really earn, when we consider how much of our lives we pay. Maybe we got the coffee for the caffeine that keeps us going when our bodies shout STOP! We look at time in different ways. Think of the airport. You can arrive early to reduce the risk of missing your flight. Or you can minimize wasted time at the airport by rushing to get on the plane mere moments before the doors close. What if you're an early bird travelling with a last minuter? So many factors affect travel time. I've decided to enjoy the journey, which is pleasant because I listen to audiobooks. Delays mean more time to enjoy. Pedestrian walking signals now have countdown timers. When a few seconds remain, rather than racing through the yellow, I slow down to stop. Computers used to be compared by chip speed. As netbooks show, weight matters more than waiting. We can be happy with slower but lighter. Design also matters. Do you remember the days of dot matrix printers? Speed was measured in characters per second. Now we look at pages per minute. I laser printed 48 pages (four 12-page proposals) and accidentally dropped them on the floor. They scattered. I should have re-sorted them but time was limited. I tossed the jumble into the recycling bin and reprinted. The time saved vanished in traffic on the way home. Sometimes we do too much: driving + listening to the radio + talking on the phone + reading billboards + watching people. We kill the time we struggle to save. We scrimp here to splurge there. We distort the way we spend our money in similar ways, as described by Michael Silverstein in Treasure Hunt (an earlier blog post). Lily Tomlin says that if even if you win the rat race, you're still a rat. Lovely. The book Faster makes you much more aware of time. At first, the audiobook (who has time to read?) seems too slow. This leaves too much time to ponder. Hurry up! You soon realize that time spent reflecting isn't time wasted --- a valuable lesson as the rats race around us. Small Cars: Is "Safer Than Ever" Safe Enough for You?